A simple instrument is described which can be used at the depth of the surgical field at the craniovertebral junction region to achieve a posterior C1-2 distraction; can correct not only the translational and vertical distraction but also the coronal rotation and tilt of the axis relative to the atlas vertebra; can maintain the distracted position between the two vertebrae while the standard C1-2 distraction and stabilization procedure is being carried out; and, can permit an objective measurement in mm of the amount of distraction and correction achieved between the C1-2 vertebrae. The craniovertebral junction (CVJ) anomalies are the consequences of anomalous development of the axial skeleton, the associated myotomes and the enclosed neuroaxial structures. Congenital atlanto- axial dislocation (AAD) is the most commonly encountered anomaly among the spectrum of CVJ anomalies anomalies and often coexists with an occipitalised atlas, basilar invagination, rotational dislocation and coronal tilt. The prevailing treatment for AAD includes relieving neuraxial pressure at the CVJ either by transoral decompression of the odontoid and the body of axis, followed by posterior atlantoaxial or occipitocervical stabilization; or, a stand-alone posterior distraction of the C1/C2 joints (also referred to as C1-2 sagittal re-alignment), followed by maintenance of the stability by posterior stabilization.,,,,,,,,, In the recent times, there has been a paradigm shift in the management protocol of AAD from bony C1-2 decompression and fusion to their sagittal re-alignment by C1-2 distraction followed by the stabilization of the two vertebrae using a posterior fusion technique. Dr. Goel described the method of C1/C2 distraction by application of a spacer between the C1-C2 joint followed by lateral mass fixation by a plate and screw technique. Eventually it has been recognized as an established form of treatment for patients with AAD, basilar invagination (BI), with or without syringomyelia., Jian et al., described the technique of intraoperative distraction between the occiput and C2 pedicle screw for the purpose of reduction of BI and AAD associated with an assimilated C1 arch, in which distraction was applied by a long retractor over the rod placed in between the axial and occipital screws. 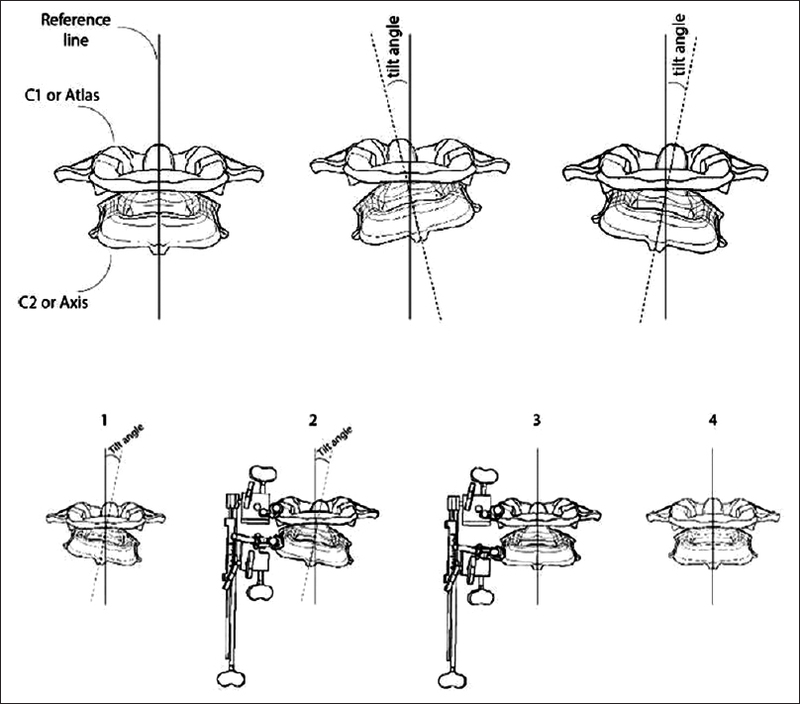 Chandra et al., described the distraction, compression, extension and reduction (DCER) technique with joint remodelling for correction of AAD and BI using screws placed in the occipital bone and those placed within the C2 pedicle, utilizing a long lever arm and a spacer as a fulcrum for reduction., Inclusion of the occiput apart from the C1 and C2 vertebrae as a part of the posterior fixation construct has the disadvantage of having higher chances of instrumentation failure on a long-term basis compared to the C1-2 posterior fixation due to its long cantilever mechanism. Thus, a C1-C2 posterior fixation is more ideal than an occipito-C2 or C3 fixation. Despite the existence of advanced techniques for distraction of the atlantoaxial vertebrae at the CVJ, specific instrumentation that can distract the C1 and C2 joints at the depth of the operative field in a simple, persistent and quantitative manner for the purpose of placement of a spacer within the joint space is still lacking. Due to the presence of a very narrow space in the region, especially in patients with a short or webbed neck and in those with torticollis or Klippel Feil anomaly, placement of non-specific instruments like an osteotome to forcefully distract the C1-2 facet joints to create space for the placement of the spacer may damage the cortical surface of C1/C2 facet joints. Drilling of the cortical surface of the C1-2 facet joints to create space for the spacer may expose the cancellous bone to the hard surface of the spacer and may lead to bony subsidence. The atlanto-axial dislocation occurs in all three Cartesian planes; the current devises only concentrate on the horizontal and vertical axes of C1-2 dislocation and often disregard the three-dimensional dislocation, especially the coronal rotation and tilt. The multiplanar distraction achieved also cannot be objectively assessed. 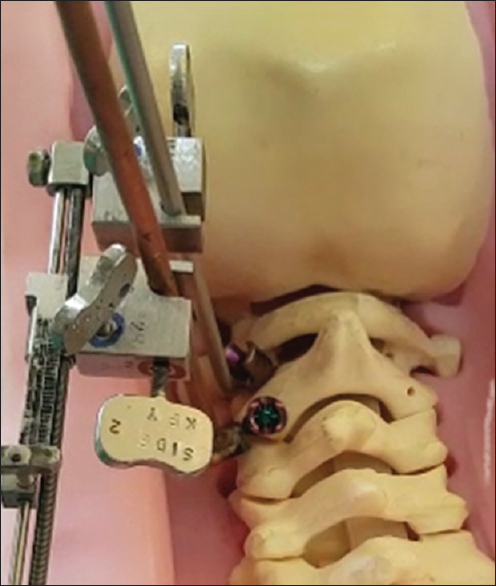 We designed a simple instrument which can be used at the depth of the surgical field at the CVJ region to achieve a posterior C1-2 distraction; can correct not only the translational and vertical distraction but also the coronal rotation and tilt of the axis relative to the atlas vertebra; can maintain the distracted position between the two vertebrae while the correct size of spacer is being chosen for insertion within the C1-2 facet joint space; and also, that facilitates an objective measurement in mm of the amount of distraction and correction achieved between the C1-2 vertebrae in all the three dimensions. The complexity of the C1-2 joints allow for six degrees of freedom of movements. This, of course, is at the cost of spinal stability. Rotation in the axial plane is the most important movement in the normal C1–C2 kinematics; this mostly occurs at the C1- C2 level and contributes to approximately 400 of movement on either side. As coupled movements of the occipital-C1-C2 complex occur in a three-dimensional plane based on the standard Cartesian coordinate system, dislocations in this region also usually occur in 3 different planes and often occur in combinations. Anteroposterior dislocation is usually accompanied by vertical dislocation (BI), rotational displacement and coronal tilt. Patients having a congenital AAD often simultaneously have associated occipitalized atlas, platybasia, BI, coronal asymmetry, rotational deformity, and torticollis, either as individual or as complex anomalies.,,,,, Optimal correction of all the simultaneously occurring bony anomalies demands a fundamental understanding of the common basic problems, that is, developmental occipital condylar and/or C1-C2 facet joint asymmetry; mechanical facet joint dislocation in various planes; as well as, the coexisting subaxial anomalies. Coexisting coronal tilt of the axis, rotatory C1-2 dislocation, and torticollis often go unaddressed while the AAD in the horizontal plane, and BI in the vertical plane, are being corrected. An insufficient multiplanar addressal of the coexisting three-dimensional anomalies at the CVJ during surgery consequently leads to a suboptimal clinical outcome; various clinical manifestations of AAD like asymmetrical spastic quadriparesis, lower cranial nerve dysfunction, and neck tilt as well as torticollis often remain unresolved following surgery. The lack of a proper device to measure the actual correction achieved on the two sides often means that the relative C1-2 distraction is being achieved intuitively and is not based on the actual measurements calculated from the preoperative radiological images. Once the distraction has been achieved using the presently available distraction methods, it is impossible to maintain the two distracted vertebrae in the desired position simultaneously on both the sides while the appropriate choice of spacer is being chosen. To provide a qualitative assessment of multiplanar distraction of C1 and C2 vertebrae for correction of AAD and BI. The instrument should facilitate the physiological alignment of curvature of the cervical spine separately on both the sides. Extreme variations in the shape of anomalous facet surfaces of C1 and C2 vertebrae should be compensated for. The instrument should facilitate the C1-2 distraction and fusion procedure at the depth of the surgical field. It should be possible to work at a distance from the actual point of surgery at variable angles within the operative field. A long lever arm mechanism should also facilitate compression of C1-C2 vertebrae from the posterior aspect over the fulcrum of the spacer for the purpose of reduction as well as correction of the rotational dislocation. In case a patients with torticollis and congenital AAD is encountered in whom the evaluation of the preoperative three-dimensional computed tomographic angiogram suggests a coronal tilt of C2 on one side, its correction by distraction of the C1-C2 joint asymmetrically based upon the exact difference in measurements on either side, and application of different sized spacer on both the sides, should be possible using the device. The device should maintain the relative positions of the C1-2 joints on either side after distraction to the exact distance in mm, while the appropriate sized spacer is being placed. The device should facilitate C1 lateral mass-C2 pars/pedicle screw fixation using all the common types of instrumentation devices belonging to different companies. The distractor device should approach the C1-2 vertebrae from a lateral aspect so as not to interfere with the surgical procedures like exposing and drilling the C1-2 facet joints on both the sides, placing the joint spacer, and tightening the 'ini' screws on the pedicle screw heads holding the rod. It should be possible to perform a distraction procedure simultaneously on the two sides. It should also be possible to perform C1-2 distraction for a variable distance on the two sides. The device broadly consists of 3 main parts. Arm 1, Arm 2 and connecting elements [Figure 1], [Figure 2], [Figure 3] and [Video 1]. 'Arm' refers to the long sticks with prongs attached at one end. The suffix number after 'arm' suggests the spine number on which it attaches. 'Arm 1' is attached to the first cervical vertebra (C1 or atlas) and 'arm 2' is attached to the second cervical vertebra of the spine (C2 or axis). The prongs of the device are of two types: rigid and rotating prongs. The rotating prong of 'arm 2' can also be made into a rigid one and maintained at any angle by rotating the horizontal rod located at the proximal end of arm 2. Commonly, the angle between the C1 and C2 joints and its articular surfaces are variable in direction, so usage of the particular type of prong depends on the orientation of the pedicle screws applied to the C1 lateral mass and C2 pars/pedicle during surgery. We can use the arm with rotating prongs on the pedicle screw placed on the atlas, and the rigid prongs on the axis, or vice versa. Also, either both the rotating prongs or the rigid prongs could be used on both C1-2 pedicle screws placed on one side. 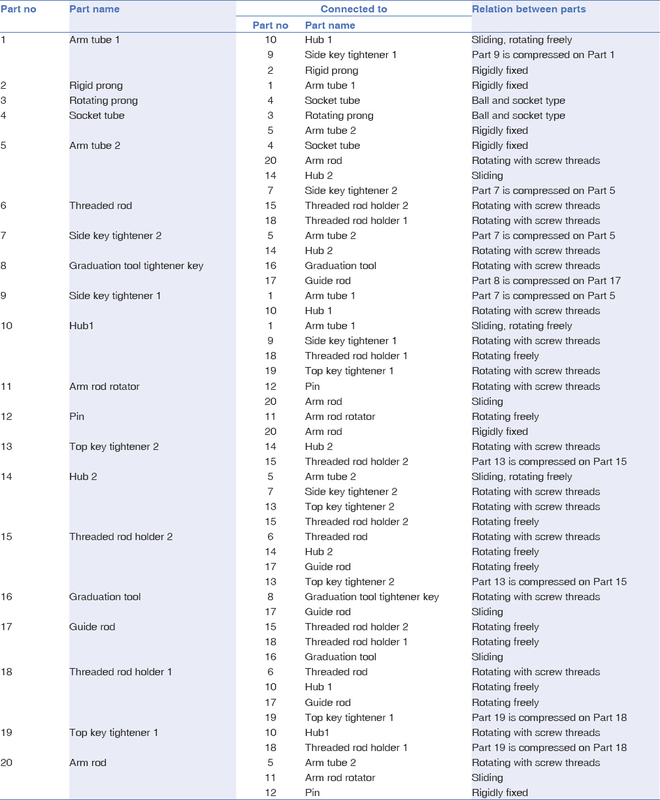 The part numbers are shown in the diagrams [Table 1] and [Figure 1]. After screw placement in the lateral mass of atlas and the pars or pedicle of axis, arm 1 (part-1) and 2 (part-5) are fixed into the threaded part of the screw just below its polyaxial screw head. Both the arms are then fixed and connected to each other using the 'connecting element' of this C1-C2 distractor and reducer [Figure 2]a and [Figure 2]b. The connecting element [Figure 2]c has two metal blocks called Hub 1 (part-10) and Hub 2 (part-14). The two arms (arms 1 and 2) can be tightened into the side groove on the hubs using the side key (part 7 and 9). Both the hubs are connected with each other by the threaded rod (part-6) and the guide rod (part-17). When rotation of the key at the end of the threaded rod is performed, the two hubs in which arms 1 and 2 are fixed, respectively, get distracted [Figure 3]. As the two hubs are distracted, the rods 1 and 2 attached to them also get distracted (arm 2 moves away from the fixed arm 1) [Figure 4]; with them, the pedicle screws placed on C1 and C2 also get distracted. This distraction may be performed to the desired level. There is an overlying graduation tool (part-16) on the threaded rod (part-6) and guide rod (part-17) with marking in mm on the top surface with 'Zero line' for the reference. This 'Zero line' is corresponding to the “pointer line” marked on the threaded rod holder-2. The particular movement of distraction of the two hubs can be measured by assessing the distance between the pointer line from the zero line in mm. After the desired distraction has been achieved, the mobile hub-2 can be again fixed at a particular point over the threaded rod by tightening of the top key (part-13). Thus, a distraction of desired length may be obtained between the C1-2 vertebrae. This distracted position of the C1-2 vertebrae may be maintained by fixing the mobile hub-2. This steadily maintained distracted position of the vertebrae facilitates the placement of desired height of the spacer (that may be chosen based on the amount of distraction required [based on preoperative images] and the exact amount of distraction achieved [measured by the graduated scale in mm on the threaded rod (part-6) and guide rod (part-17)] in mm, at the C1-2 joints, which correlates with the free space available between hub1 and 2. Once distraction between the vertebrae have been achieved, and spacer is placed within the facet joint space, a titanium rod of appropriate length may be placed in the groove of the polyaxial screw heads of the screws that have been already fixed and an 'ini' screw tightened over it to fix the rods. Rotating the top handle of rods 1 and 2 loosens the grip of the rotating prong (part-2 and part-3) from the pedicle screws and this C1-2 graduated compression distraction device can then be removed. The entire sequence may then be repeated on the contralateral side. A simultaneous distraction may also be achieved on both the sides using two devices that are fixed on bilaterally placed C1-2 pedicle screws. It is also possible to perform a variable distraction on the two sides (to correct a coronal tilt or scoliosis) by permitting distraction of different lengths to occur based on the corrections required on the two sides. The C1-2 distraction permits correction of the vertical dislocation of odontoid (BI) and also permits a change of orientation of the posteriorly directed and retroverted odontoid to a more vertical one, so that its tip and anterior surface move closer to the anterior arch of atlas, thus widening the canal diameter at cervicomedullary junction, and to an extent, also correcting the translational C1-2 displacement. The graduated compression and distractor device initially maintains this position during surgery until the joint spacer is in place and the intervening titanium rod is tightened over the pedicle screws. The final rod tightening and placement of the spacer eventually sustains the same distracted final position of the atlas and the axis vertebrae. The translational displacement between the atlas and axis is also corrected following opening of the C1-2 facet joints, placement of the pedicle screws, and tightening of the 'ini' screws on the straight rod. As the 'ini' screws are tightened on the C1-2 pedicle screw heads holding the rod, the manoeuvre pushes forward the posteriorly displaced axis vertebrae, and retracts the anteriorly displaced lateral mass of atlas, to bring the two lateral C1-2 facet joint surfaces in alignment (thus eliminating any C1-2 translational displacement). The same manoeuvre also permits a simultaneous correction of the relative C1-2 angular displacement (rotation) by exploiting the property of inherent coupling of movements at the spine, once the final tightening of the rods is performed. Thus, the corrective translational movement of the axis relative to the atlas following the distraction and the rod tightening procedures, also corrects the rotatory and angular displacements between the vertebrae. Differential compression on the C1-2 vertebral bodies on the two sides can also be applied simultaneously utilizing the long rods of this device. These are attached to the pedicle screws utilizing the prongs fitted at their distal ends, for the purpose of further achieving rotatory and angular correction between the atlas and axis. As has already been mentioned, a relative coronal tilt between C1-2 vertebrae due to the presence of asymmetrical occipital condyles or C1-2 facet joints may be corrected by an appropriate asymmetrical distraction simultaneously performed on the two sides. 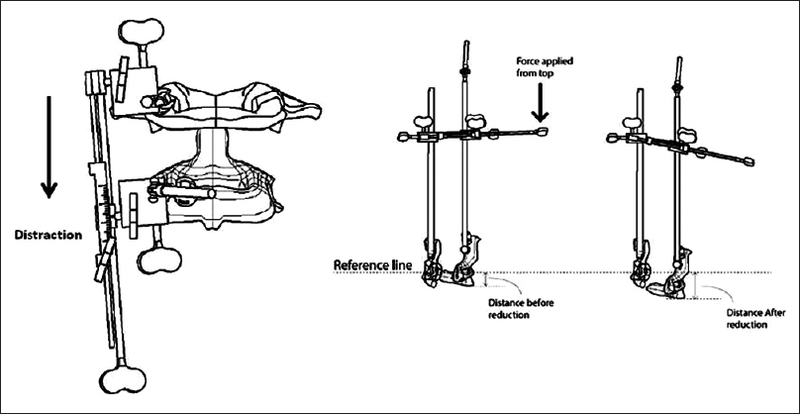 This asymmetrical distraction may be maintained by choosing different sized spacers on the two sides and by maintaining a differential C1-2 distance while the 'ini'screws are being tightened over the rods placed on the screw heads [Figure 5], [Figure 6] and [Video 2]. The amount of distraction required on the two sides may be calculated on preoperative images, and the distraction required to the exact millimetre may be executed during surgery. This distraction is exclusively between the atlas and the axis, which is physiologically more appropriate than carrying out the distraction between the occipital bone and the axis vertebra. The long lever arms of the device that have adequate length to emerge out of the operative wound help in maintaining C1-2 distraction from an appropriate distance; likewise, while this distraction is being maintained, the long instruments provided by various companies help in the placement of the spacer into the facet joint space and in the tightening the 'ini' screws over the rod fixed in the groove on the pedicle screw heads, again from a distance. This ability to work from a distance rather than in the depth of the confined space available in the surgical field greatly facilitates the ease of surgery. During the preoperative evaluation, assessment of the bony parameters utilizing dynamic CT scan images of the CVJ permits the measurement of the atlanto-dental interval, the degree of BI, the amount (in millimetres) of distraction required to correct the BI, as well as the degree of differential distraction required on the two sides to correct the coronal tilt and rotational dislocation for achieving an optimal cervical re-alignment. The cervical traction is applied for the intraoperative duration after induction of anesthesia, and the traction weight is usually 7-10% of body weight. The patient is placed prone on a horse-shoe head-rest with the head-end elevated by 20 to 30 degrees. The head should be either in neutral or slight neck-extended position but never in a neck-flexed position. An adequate padding of the eyes with a meticulous assessment of the head position to avoid pressure on the eyeballs should be performed. A midline incision is given from just below the inion to up to the C5 spinous process. The subperiosteal dissection of the paraspinal muscles exposes the posterior arch of atlas and the lamina of axis. The atlantoaxial facet joints are widely exposed on both the sides after sectioning of the C2 ganglion. The joint capsule is excised and the articular cartilages of the facet joint surfaces of the atlas and axis are denuded. C1 lateral mass and C2 pars/pedicle screws are applied according to the standard entry points and trajectory (in adult patients, the screws utilized are usually of 3.5mm thickness and 18-22 mm length standard polyaxial screws; they may be of any standard company). Arm 1 and Arm 2 of the distractor are connected to the groove below the polyaxial screws placed on the C1-2 vertebrae, respectively [Figure 4] and [Video 1]. The connecting element is introduced from the side and is connected to Arm1 and Arm2. This connecting element lies outside of surgical wound and is always oriented towards the lateral aspect of the arms 1 and 2. The zero line of the graduation tool is set and corresponds to the pointer line on the mobile hub 2. The key of the threaded rod (part-6) is rotated, which causes the mobile hub 2 to move away from the fixed hub 1. The long arms attached to the two hubs proximally, and the pedicle screws placed on the C1-2 vertebrae distally, also get distracted with respect to each other and the distraction may be measured on the graduated scale. The C2 vertebra is distracted with respect to the C1 vertebra until the planned distraction and reduction of C1/C2 is achieved. Compression can also be applied simultaneously on the long rods attached to the connecting element for the purpose of reduction of AAD. A spacer of appropriate length may be placed within the C1-C2 joint spaces on the two sides. The placement of the spacer within the joint space is facilitated by the distraction produced by this graduated C1-2 distraction compression device. Then the rod is placed within the groove of the pedicle screw heads and 'ini' screws of appropriate length are tightened over it to maintain the final distracted position of the C1-2 vertebrae. The connecting element is then loosened from the long arms and removed; the prongs at the distal end of the long arms are disengaged from the grooves below the pedicle screw heads and also removed. The C1 and C2 vertebrae are now held tightly by the rod in the desired distracted and reduced position. The procedure of distraction and stabilization on the contralateral side may be sequentially or simultaneously performed. The distractors are similar in design for the two sides but are particular for the right and left side, as they always have to be maintained lateral to the pedicle screws for permitting the facet joint stabilization procedure to be simultaneously carried out. Pieces of cortico-cancellous bone harvested from the iliac crest are additionally packed into the joint space available by the sides of the already placed joint spacer. Additional bone grafts are placed between the posterior arch of atlas -suboccipital bone complex as well as on the posterior elements of the axis vertebra after decorticating the exposed occipito-atlanto-axial bones with a suitable drilling burr. Postoperatively, the traction is discontinued and the patient is placed on a hard cervical collar to restrain his/her neck movements for 3 months until a bony C1-2 fusion has been obtained. The bony union of the C1-2 facet joints may be ascertained on subsequent bone-window CT images of the CVJ. This technique may be difficult to perform under three circumstances. These circumstances arise mainly on account of the difficulties encountered during the proper placement of pedicle screws on the atlas and axis vertebrae rather than due to actual failure in the usage of the currently described device. First, in patient with AAD with an occipitalised atlas, with a very highly placed BI, that is often associated with a retroverted odontoid process (the condition is often associated with an occipital condylar or a C1-2 facet joint hypoplasia), it may be difficult to place pedicle screws in the hypoplastic lateral joints; distraction and reduction of AAD and BI may be incomplete resulting in persistent cervicomedullary bony compression; and, attempting to induce excessive traction in order to obtain a complete reduction of a high BI may cause undue traction of the spinal cord, leading to an increase in the degree of neurological deficits. Second, in the presence of significant C1-2 coronal tilt, rotation or upper cervical scoliosis, the orientation of one of the facet joints becomes too anterior, and the other too posterior for the proper placement of pedicle screws. As this condition is usually associated with asymmetrical facet joints, even drilling of facet joints and a forced correction of the axis vertebra in an attempt to bring it to a proper alignment may result in excessive torsion of the cervicomedullary neuraxis, resulting in neurological deterioration. Third, in the presence of an anomalous high-riding vertebral artery with a narrow axial isthmus, and especially if the dominant vertebral artery crosses the C1/C2 facet joint surface from a posterior aspect on one side, placement of a C1 lateral mass/C2 pedicle or pars screw may be a relative contraindication due to the high risk of vertebral artery injury. Modifications of this instruments may also make it appropriate for usage for an occipito-subaxial posterior distraction and fusion. In the future, the usage of the device may be extended to bring about an accurate C1-2 distraction utilizing robotic devices based upon the exact preoperative measurements of C1-2 distraction required in the three Cartesian planes. The design of the instrument has been prepared by the 'Design Inventor' software at Indian Institute of Technology (IIT), Kanpur, as a joint collaboration between the Department of Mechanical Engineering, IIT Kanpur and the Department of Neurosurgery, Sanjay Gandhi Postgraduate Institute of Medical Sciences, Lucknow based upon a memorandum of understanding signed between the two institutes. The provisional patent application duly filed on October 6, 2017 has been accorded application number 201711035521. This constituted the graduation project of Karthik PB performed under the guidance of Professors Nachiketa Tiwari and Sanjay Behari. Sardhara J, Behari S, Sindgikar P, Srivastava AK, Mehrotra A, Das KK, et al. Evaluating atlantoaxial dislocation based on Cartesian coordinates: Proposing a new definition and its impact on assessment of congenital torticollis. Neurosurgery 2017 May 3. doi: 10.1093/neuros/nyx196. Behari S, Bhargava V, Nayak S, Kiran Kumar MV, Banerji D, Chhabra DK, et al. Congenital reducible atlantoaxial dislocation: classification and surgical considerations. Acta Neurochir (Wien) 2002;144:1165-77. Jain VK, Behari S. Management of congenital atlanto-axial dislocation: Some lessons learnt. Neurol India 2002;50:386-97. Sardhara J, Behari S, Jaiswal AK, Srivastava A, Sahu RN, Mehrotra A, et al. Syndromic versus nonsyndromic atlantoaxial dislocation: Do clinico-radiological differences have a bearing on management? Acta Neurochir (Wien) 2013;155:1157-67. Sardhara J, Behari S, Mohan BM, Jaiswal AK, Sahu RN, Srivastava A, et al. Risk stratification of vertebral artery vulnerability during surgery for congenital atlanto-axial dislocation with or without an occipitalized atlas. Neurol India 2015;63:382-91. Salunke P, Behari S, Kirankumar MV, Sharma MS, Jaiswal AK, Jain VK. Pediatric congenital atlantoaxial dislocation: Differences between the irreducible and reducible varieties. J Neurosurg 2006; 104:115-22. Goel A. Treatment of basilar invagination by atlantoaxial joint distraction and direct lateral mass fixation. J Neurosurg Spine 2004;1:281-86. Srivastava AK, Behari S, Sardhara J, Das KK. Simultaneous odontoid bilateral posterior C1-2 distraction and stabilization utilizing bilateral posterolateral corridors and a single posterior midline incision. Neurol India 2017;65:1068-75. Srivastava A, Sardhara J, Behari S, Sindgikar P, Joseph J, Das K, et al. Knock and drill technique: Simple tips for the instrumentation in complex craniovertebral junction anomalies without using fluoroscopy. J Neurosci Rural Pract 2017;8:14-19. Goel A, Desai KI, Muzumdar DP. 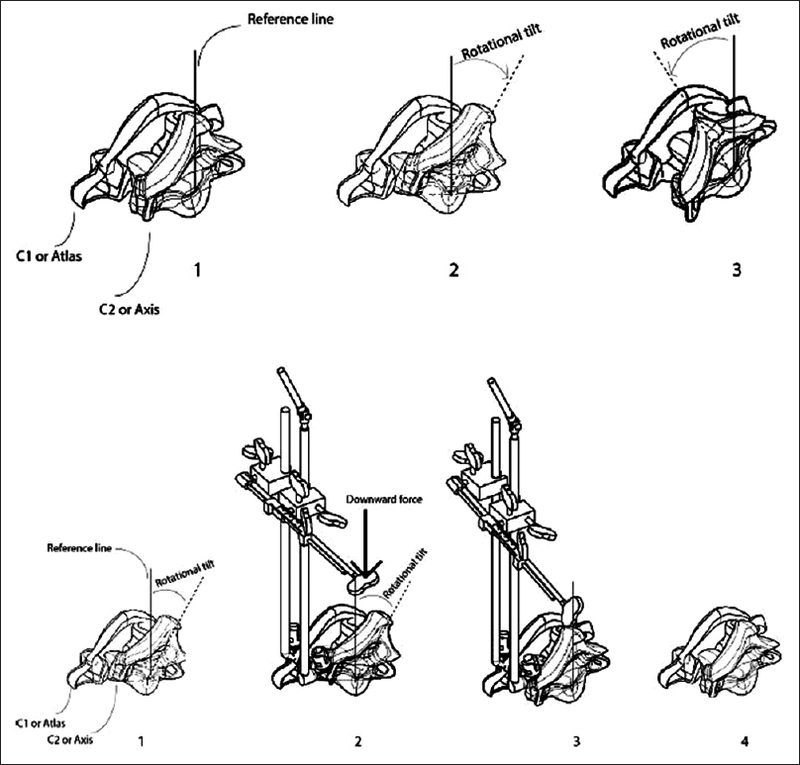 Atlantoaxial fixation using plate and screw method: A report of 160 treated patients. Neurosurgery 2002;51:1351-7. Goel A, Kulkarni AG, Sharma P. Reduction of fixed atlantoaxial dislocation in 24 cases: Technical note. J Neurosurg Spine 2005;2:505-9. Goel A, Sharma P. Craniovertebral junction realignment for the treatment of basilar invagination with syringomyelia: Preliminary report of 12 cases. Neurol Med Chir (Tokyo). 2005;45:512-8. Jian FZ, Chen Z, Wrede KH, Samii M, Ling F. Direct posterior reduction and fixation for the treatment of basilar invagination with atlantoaxial dislocation. Neurosurgery 2010;66:678-87. Chandra PS, Kumar A, Chauhan A, Ansari A, Mishra NK, Sharma BS. Distraction, compression, and extension reduction of basilar invagination and atlantoaxial dislocation: A novel pilot technique. Neurosurgery 2013;72:1040-53. Chandra PS, Prabhu M, Goyal N, Garg A, Chauhan A, Sharma BS. Distraction, compression, extension, and reduction combined with joint remodelling and extra-articular distraction: Description of 2 new modifications for its application in basilar invagination and atlantoaxial dislocation: Prospective study in 79 cases. Neurosurgery 2015;77:67-80. Sindikar P, Das KK, Sardhara J, Bhaisora KS, Srivastava AK, Mehrotra A, et al. Craniovertebral junction anomalies: When is resurgery required? Neurol India 2016:64;1220-32.